One common theme that runs through many of the topics I end up discussing is that of the differences between Japanese and English nuance, and how much of that gets lost in translation. 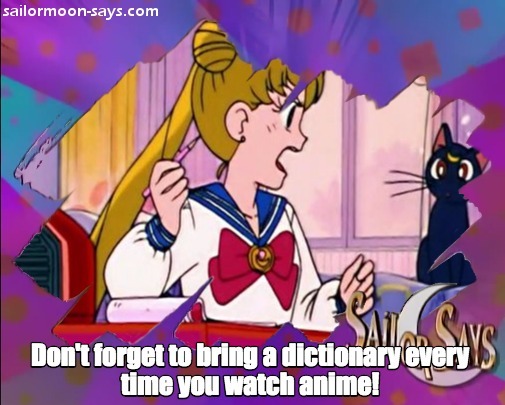 I want to make it clear that I don’t mean this as an indictment against some of the translators who have taken on (or been assigned) the challenge that Sailor Moon has to offer. 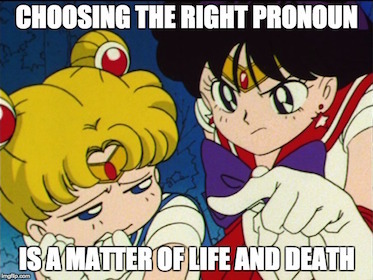 In fact, I’d like to take a look at some of the challenges people face when translating Sailor Moon – or really, any Japanese media with a sufficiently deep enough plot – into another language. This topic may be a little inside baseball, but if you’ve ever been interested in the art of translation, this article may be for you! It’s about to get serious! One of the things that makes translating a fictional story incredibly difficult is that, quite frankly, you can never really be sure if you’ve made to correct choice. After all, there’s no encyclopedia you can cross-check, and when you’re talking about something totally unique to the story, you might only have a few sentences, your gut instinct, and your sense of the story’s lore to go by. The other major difficulty that translators face is striking a balance between telling a compellingly written story and staying true to the nuance of the original text. The Japanese language is built largely on implication and subtext, which makes for some pretty harsh-sounding sentences if you don’t rewrite things. But when you do, you’re depriving readers of the same experience Japanese fans had, right? So we’ll be talking about four cases of these issues today, and about the problems these linguistic issues cause both the translators and the fans who read/watch the end product. 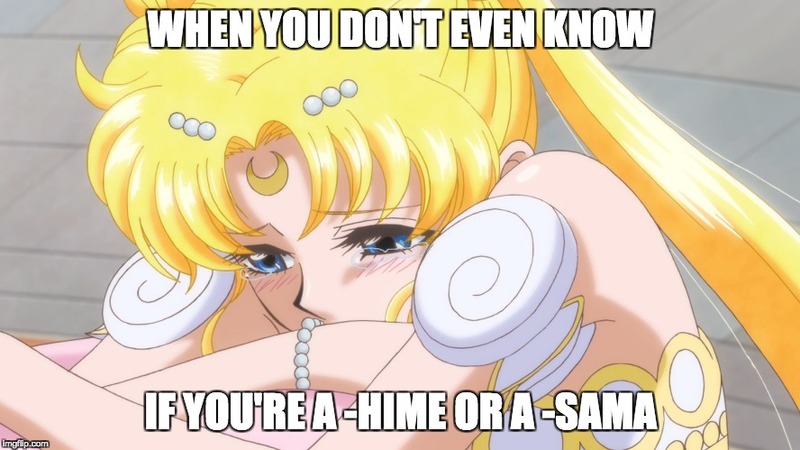 Any long-time fan of Japanese anime, manga, games, light novels, J-dramas, sentai shows, or any other form of Japanese media is probably familiar with many of the most common Japanese honorifics: -sama, -san, -chan, -kun, etc. You probably are also aware, at least on some level, of what additional meaning they convey about the relationship between the two or more parties involved. So what’s the problem here? Well, while these additions do add some (sometimes important) nuance to the Japanese source text, leaving them in when translating to English is a bit of a cheat since it makes the translation more of an “English-fied Japanese sentence” and not an English-language version of the original Japanese. That gets even more problematic when translating text from a manga/anime where the speakers shouldn’t even be speaking Japanese in the first place, such as a Japanese manga adaptation of a western movie. There’s no right answer on how to deal with this, but it’s something that the translator needs to decide while thinking about their target audience and the setting in the series. Personally, I almost always cut out honorifics in translation, but that’s because I value a more natural-sounding end product. Don’t get caught using the wrong one! I’ve already discussed at length some of the issues with first-person pronouns that come up when translating Japanese into English. One of the most popular examples is with Haruka in the manga. In the manga, she uses both the feminine アタシ (atashi) to refer to herself as Sailor Uranus and the more masculine 俺 (ore) when talking as Haruka. The anime just threw this all together into the still male-focused, but more boyish, 僕 (boku) and dropped the nuance of her changing between the two. Both Hawk’s Eye and Fish Eye also use the feminine アタシ (atashi) in the manga, while all three of the Amazon Trio use the boyish 僕 (boku) in the anime. So what’s a translator to do? Unfortunately, there’s not much they can do, other than maybe translate the rest of the sentence to read more gruff or feminine, depending on the pronoun. But it’s definitely a tough issue to face as a translator. Is Kinmokusei a Planet or a Star? This is one of those issues where we simply don’t have enough information within the series, and there’s nothing outside the series that we can refer to in order to get a clear answer. You see, the problem arises from the fact that the last character in Kinmokusei (キンモク星) is 星 (hoshi, sei), the kanji for “star.” At first blush this may seem like an open-and-shut case, but unfortunately it isn’t. You see, Japanese refers to many types of astral bodies as 星, regardless of whether or not they’re a star. A great example of this is Final Fantasy VII. You know how the story focuses on hearing the voice of the plant, the planet crying out, saving the planet, and all that good stuff? 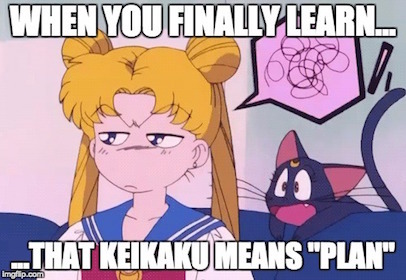 Well, the “planet” is referred to in all Japanese text as — you guessed it! — 星. All of the planets in our solar system (with the exception of Earth) also end in the kanji 星 (e.g., Mercury = 水星, Venus = 金星, Mars = 火星…), which pretty much cements in my mind that Kinmokusei is actually the planet Kinmoku. Gonna need to look up some words! “A Rose by Any Other Name…” Translate It or Leave It? 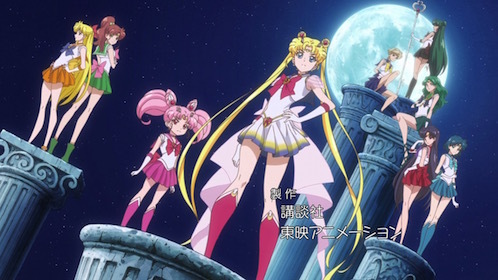 So we’re all pretty much okay with Tuxedo Kamen Mask, but Sailor Chibi Mini Moon makes fans cry tears of blood. This is a big issue that all translators face when confronted with either made up names, or names that use real world words in them. To what extent should you stick close to the source material and leave it in Japanese? And at what point does leaving it in Japanese hurt the reader’s understanding of the story. When confronted with nearly any proper noun, the translator is going to have to make a choice on how they want to deal with this, and where to leave the Japanese and where to change it to English. When I translate manga, my general rule of thumb is: did the author use this word because of an important nuance/unique name, or did they intend readers to interpret it as-is? In the case of Tuxedo Kamen, his name is literally a combination of the words “tuxedo” and “mask.” Just like we wouldn’t call him Takishiido, I’d say it makes more sense to translate Kamen into Mask. However, since “Usagi” is a proper name, and we don’t generally translate names (i.e., “Rabbit” or “Bunny”), “ChibiUsa” in turn should also be treated as a proper name. Though her name comes from combining chibi (small) with Usa, this becomes her actual name and shouldn’t be parsed separately. 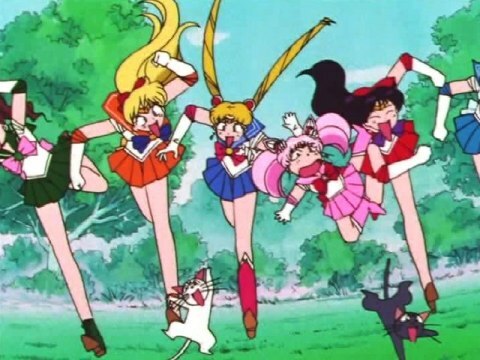 Similarly, this carries over to ChibiMoon, which is why I wouldn’t translate it. Wait, is THAT what keikaku means?? Though I wish I could say definitively what is correct when you’re translating, unfortunately the fact of the matter is that the answer is almost always “it depends.” While I know the way that I would do things, that doesn’t necessarily mean another translator doing it differently is wrong. What’s ultimately most important is taking into consideration what the needs are of the reader. Do they need to understand the absolute minutia and fine nuance, like when reading a contract translation? Or do they just want to read a fun story that happens to have been originally in Japanese? Ultimately, I think “right” and “wrong” is for the reader to decide. I worked on a fansub for a short time, and translating is a more interesting and complicated business than I would have thought (and I already knew it wasn’t simple and things often can’t be directly translated). I completely agree with you on honorifics. A fansub shouldn’t use any words or phrases that aren’t part of the English language, and should be completely understandable to someone who doesn’t know any Japanese (including honorifics). Yes, it’s an imperfect translation when you can’t include things like “-chan” to show that people are close… but that’s just too bad. The informed anime viewer will get to hear the -chan and understand it anyway. Pronouns: like you said, a translation just can’t include every little aspect of the language. The gender neutral pronouns of English work just fine. If someone cares enough that they HAVE to know every little detail of meaning that was spoken… well, they’ll just have to learn the language. The only alternative is to have a paragraph of footnotes along with every subtitled line, and that’s ridiculous. Names: I think these should never be translated. Usagi isn’t “Bunny”. Chibiusa isn’t “Miniusa” or “Smallusa” or “Minibunny” or any other combination of translated terms. Ami’s last name is Mizuno, not Waters or something like that. 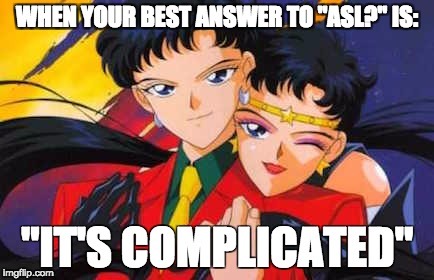 For the sake of consistency, I would leave Tuxedo Kamen as it is. Yes, we don’t use “Takishiido” because clearly that part of the name is meant to be the English word Tuxedo. However, the creator chose not to use English for both words… she chose to use Tuxedo Kamen and not Tuxedo Mask. The name is a mix of two languages and it should stay that way. However, if there ever was a time to bend the rules it would be in this situation. Viewers in Japan understood his name to mean “Tuxedo Mask”. It’s not a given name, it’s a code name based on exactly what he is wearing. The really interesting part of translation imo is how hard you should try to make the lines sound like a native English speaker. Most translators go for a too-direct translation, and that’s mostly fine because you definitely get the meaning of what the person is saying. But when it comes to anime, there are certain phrases that come up repeatedly that you really don’t normally hear in English. I can’t recall much since it has been a while for me… the only one that comes to mind right away is “at a time like this”. Characters are often saying “how can you think about X, at a time like this?” or “at a time like this, you can’t really be considering X?” I prefer to reshape what they’re saying into something that would be normally said by a native English speaker. For instance “you can’t seriously be considering X right now?” or “are you kidding? this isn’t the time to think about X”. Sometimes it’s hard to do this without losing some of the original meaning, in that case I would leave it as the too-direct version. Of course, you can go too far with it, and some translators do. Adding slang, trying to give a character a dialect (like a Southern accent) using misspelled or abbreviated words, it can be too much. And then of course there are translations like the DiC dub where all they care about is following the basic storylines, but write whatever dialogue they want for anything that isn’t a core storyline element. I can’t stand what DiC did, and it seems so weird to me that some fans prefer it. I guess it’s just nostalgic for them. I have a セーラームーンS Mook (Movie+Book), and Tuxedo Mask is written in English as “Tuxedo Mask”, with タキシード仮面 right next to it. So, I say, it’s intended to be “read” as Tuxedo Mask. And of course, official merchandise (the Sailor Moon musical?) also listed Hotaru as “Sailor Satan.” =D So the English sources are all over the place sometimes. And don’t get me started on the Tenoh vs. Tenou spellings for Haruka’s name!